Cooler weather makes me think of baking and home-made banana nut bread is one of my all time favorites. Here's my mom's famous banana nut bread recipe that I'll share with you. My mom used to make several at once and we would wrap up the extra ones and freeze them for later. This recipe is the best from scratch banana nut recipe I've tried. The secret is beating the egg whites separately until they are fluffy. It's worth the extra step. Cream the butter and sugar in a large bowl. Add egg yolks, bananas, buttermilk, and vanilla. Mix. In a separate bowl beat the egg whites until they are stiff. Set aside. Add the dry ingredients to the main mixture and mix. Now fold in the egg whites and the nuts. Grease and lightly flour a loaf pan and pour the batter into the pan. Bake at 350 degrees for 45-60 minutes (depends on pan). 25 min for mini loaf pans. Happy Eating! My mom would be pleased her banana nut recipe lives on. It is a source of yummy memories for all my family. We often make a number of loaves and freeze them and then give them away during the holiday season. Do you know anyone who doesn't love banana bread? If you like fruit recipes, you might also try the mixed berry pie recipe. It is delicious, easy to make, and very healthful. I love banana bread and can’t wait to try this recipe. I like to take it trailriding because it stands up to banging around in the saddle bags. Wow, I just tried the recipe and it was incredible. The whipped egg whites add a new dimension to banana nut bread. Thanks for sharing. I’ve been trying different quick bread recipes over the past year. 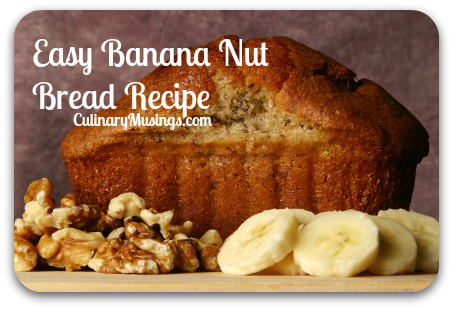 I just wanted to let you know this banana nut bread recipe was my favorite. I made several loaves of this bread before the holidays and froze it. Then, when we had guests drop by, I would pull the bread out of the freezer and pop a few pieces under the broiler. Great stuff. I used this recipe the other night and I used 4 instead of 3 bananas (mostly because I had 4 about to go bad and wanted to use them up). The banana bread came out even better. It was a bit more moist, but my family liked it more than the 3 banana version (which they also loved). Hi may I know what kind of flour that you use?? All Purpose (AP) flour. I prefer the unbleached, but any will work.